Local yarn dens provide an antidote to high-level urban stress in a clubby setting. Knitty City. Photo by Linda Dyett. Knitting shops in New York? Who in this hectic town has the time or patience to sit down and transform a length of wool string into a garment, one stitch at a time? But most of all, for the bevies of women (and men too) packing Manhattan’s yarn shops, knitting is a social act. With walls and bins displaying a riot of colors and textures, these yarn havens function as de facto community centers with strong local followings—retirees, out-of-work Millennials, residents of tiny apartments that lack a living room. Many customers come for the afternoon; some settle in for the day. That said, there’s a bit of clubby clique-ishness at some stores, and snarky officiousness at others—which can be off putting for newcomers. But persevere: the yarns are beguiling—all weights of cashmere, silk, merino, alpaca, cotton, linen, and even yak, from super-duper bulky to gossamer-thin. And the level of knitting expertise offered at these places is as high as it gets. 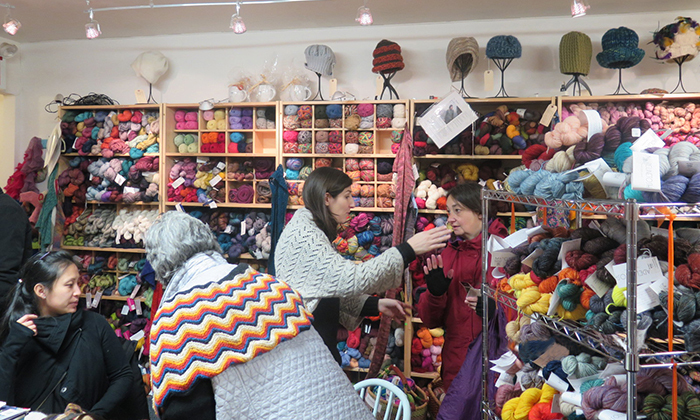 Below is a rundown of the best knitting shops in Manhattan, most of which offer workshops and/or private instruction and finishing services. Each shop offers something unique that makes a trip across, down-, or uptown well worth it. “This place is the antithesis of bitchy,” says an ardent knitter who trawls the yarn stores all over town. Adored by its customers, Knitty City, operating in Zabar’s terrain since 2006, must be the world’s most high-energy knitting emporium. Not only are both staff and customers effervescent, but yarns explode off the shelves into baskets on the floor, and even the cash desk is crowded with stitchery paraphernalia and bottles of no-rinse eucalyptus wash. The responsible party is the owner, Pearl Chin, a non-stop crafts-loving dynamo who previously wholesaled origami. “Don’t tell my husband,” warns Chin, but she can’t say no to customers’ new-yarn requests and probably stocks New York’s largest selection. Adding kaleidoscopic excitement are many color-changing hand-dyed yarns, like Nooch Fiber merinos (tinted by a moonlighting Upper West Side immunologist and psychologist in their kitchen sink). Despite the helter-skelter atmosphere, knitting conundrums are solved by instructors who assist customers at a round table. Many have formed lifelong friendships with other knitters and staffers, and regard Knitty City as a second home. 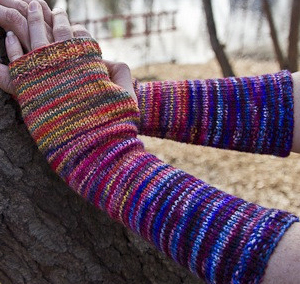 Above left: Chiagu’s Freemans Alley Mitt Kit in three successive colorways of Koigu merino ($30). The shelves are jam-packed with smartly edited, well-organized selections of the sophisticated, rustic, and eco-friendly yarns favored by Bobry’s diverse customers (neighborhood oldtimers, edgy Loisiders), Favorites include well-priced basics from Briggs & Little, Canada’s oldest woolen mill. (I love the chunky roving.) Squirreled away on an upper shelf is a stash of vintage patterns. 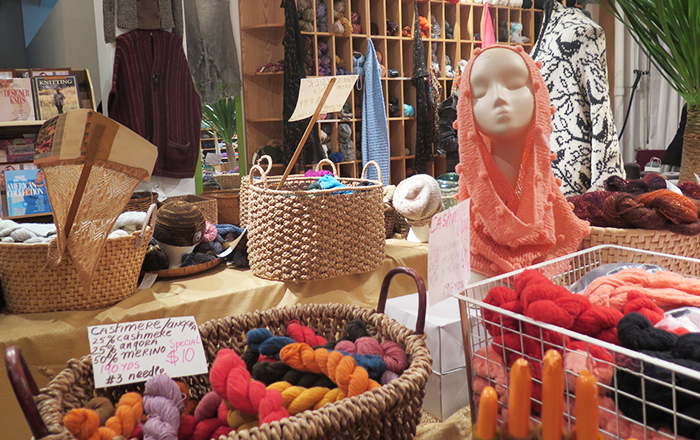 New York’s widest variety of knitting workshops are offered at the wooden farm table. The popular Sweater Design series is taught by in-house designer-pattern-writing whiz Irina Poludnenko. Above left: Children’s cardigan in sport-weight Schoppel Ambiente merino, space-dyed to create automatic stripes. ($20 to $30). Annie’s is on the move. 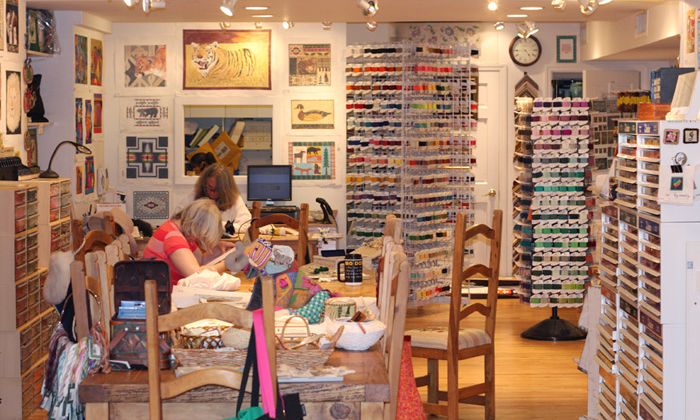 A busy Carnegie Hill needlepoint-knitting mainstay since 2007, it’s been hit with a stratospheric rent hike and is relocating to much larger, sunlit Yorkville quarters—2,600 square feet—more than enough space for its profusions of yarns and enthusiastic customers. Annie Goodman, the congenial owner, who retains an evident poise from her figure-skating days, is investing the new space with a big round table, as well as her reliable long wooden tables and tête–à–tête seating arrangements with club chairs—for private sessions, taught by the shop’s five eager and knowledgeable instructors. Yarns include many ornamented selections, such as Artyarns best-selling Beaded Mohair & Sequins, wrapped with silk thread. 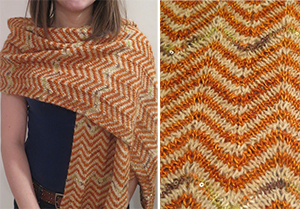 Above left: Ripple-stitch scarf in Galler Alpaca, Color Song silk-blend Maiden Hair, and Artyarns Beads Mohair & Sequins ($130). Named after one owner’s German Shepherd and orange tabby cat, Loopy Mango in Soho is a rare knitting shop that attracts tourists as well as locals. The lure? 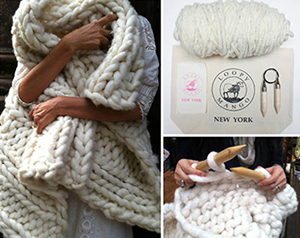 The world’s ultra-bulkiest yarn (a merino known as Big Loop, knitted on size 50 needles! ), presented in a cavernous cast-iron space that has been reinvented as a Victorian-Depression-Era-multi-ethnic curiosity shop, choc-a-bloc with vintage and faux-vintage clothing, shoes, jewelry, West African throws, and bric-a-brac—all for sale. The owners are hip-and-cool émigrés: Russian-born Anna Pulvermakher, a former software test engineer, and Korean-born one-time restauranteur Waejong Kim. They met at an FIT workshop, discovered a shared love of knitting, and decided to open a store selling oddball items they loved, but couldn’t find elsewhere. Unable to find a source able to spin their outrageously oversize merino, they opened their own mill, run by Kim’s husband in Brimfield, Massachusetts. Big Loop, which knits into scarves, cowls, wraps, throws, blankets, and pouf covers, is sold both in skeins and in kits with birchwood needles. Also available: a well-edited selection of standard bulky to lace-weight yarns with an emphasis on off-whites, ecrus, and washed-out taupes. Above left: Nantucket Throw kit, ($242). When Linda Morse retired in 2002 from a career as a dot-com CEO, her husband gave her the If not now, when speech; she promptly opened a knitting shop in Barneys territory. String is now Manhattan’s most elegant yarn depot—a tidy, pristine couture bastion that offers, for instance, a cardigan pattern based on a recent Chanel jacket. And it’s now under new ownership: Stacy Charles of Tahki Stacy Charles fame. The specialties are String’s own cashmere exclusives, including a bulky boucle. The action takes place at a marble-topped table where hands-on advice is given and project-driven private lessons are held. Lidia Karabinech, the in-house designer, writes custom patterns and often does complex finishing—even building in zippers. 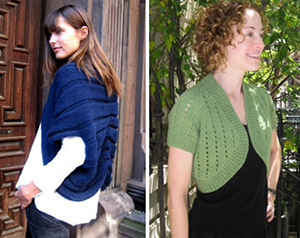 Above left: Cocoon Shawl in String’s Grande cashmere ($204-528); Lace Bolero in Classica ($192-288). A busy pan-needlework bastion, Purl Soho exudes today’s refined, high-end crafts sensibility. Indeed, two of the owners, Joelle Hoverson and Page Marchese Norman, were stylists at Martha Stewart Living; they’ve created a smoothly flowing space, artfully lined with display tables (one exhibits a book of Estonian needlecrafts). Yarns are up front; quilting and other supplies are in the back. Among Purl Soho’s exclusives are several weights of loosely-spun, rustic-style merino wool, as well as a wide array of patterns—including contemporary takes on traditional knits. 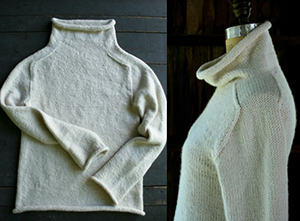 Above left: Funnel-neck pullover in Purl Soho Worsted Twist merino, ($150 in medium). Squirreled away in a garment industry building in what is now prime NoMad turf, New York’s oldest yarn shop got its start in 1947 as a pencil and paper supplier for nearby Parsons and FIT. Gradually the inventory shifted to yarns. Run since 1994 by Russian émigré Berta Karapetyan, School Products now sells its own esteemed range of Karabella basics from Italy, as well as a beguiling slew of discounted designers’ odd lots from Italy—loosely hanging skeins of silk tape, hand-dyed cashmere, lace-weight merino, and other beckoning treasures. These make this place the alluring equivalent of those odd-lot fabric stores that dot the neighborhood. Karapetyan may be the only yarn retailer who comes out of the garment trade, having served as a pattern maker for Ralph Lauren, Calvin Klein, et al. Result? In-house designs with a high fashion quotient. Also available here is a must-have CD of World War II knitting songs. Above left: Kimono-cardigan in alpaca-blend Karabella Aeros ($60). Since schedules and offerings are always in flux, check individual websites for current classes, times and prices. String Yarns 33 East 65th St., 2nd floor, 212-288-9276. Classes and private instruction for beginners and intermediates. The private Finishing with Lidia session offers professional-level skills. Knitty City 208 West 79th St., 212-787-5896. Knitting classes, including hat-making, and crochet labs for beginners, intermediates, and kids. Downtown Yarns 45 Avenue A, 212-995-5991. Classes in knitting and crochet for beginners, intermediates and kids. Workshops in mittens, hats and socks, spinning yarn, drop-spindle, finishing and pattern making. Loopy Mango Online only. Throw your own knitting party, host gets free Loopy Mango DIY kit, participants get a 10% discount. Free video tutorials. 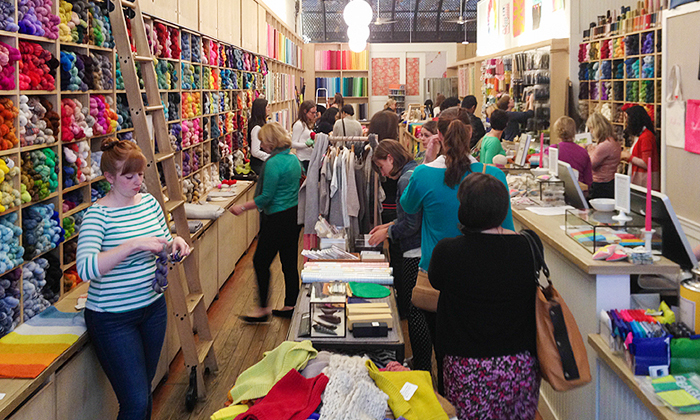 Purl Soho 459 Broome St., 212-420-8796. Classes in knitting, crochet, needlepoint, sewing, patchwork, hand appliqué, embroidery, custom monogram, weaving, spinning, needle felting and pattern making for beginners and intermediates. School Products Yarns 13 E. 37th St., 212-679-3516. Classes for beginners and intermediates in knitting, crochet, pattern-making; hats, mittens, scarves and socks. Annie & Company 1763 2nd Ave., 212-360-7266. See website for upcoming classes in knitting and needlepoint. Argyle Yarn Shop 288 Prospect Park West, 347-227-7799. 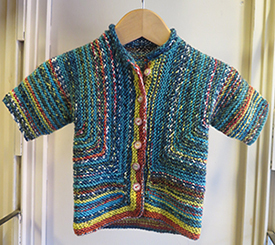 Parent and Kid Workshops, Entrelac, Lace Knitting, as well as beginning and advanced knitting. Brooklyn General Store 128 Union St., 718-237-7753. Wide selection of classes including spinning, knitting, quilting, and needlepoint. One day workshops and open studio time. Slip Stitch Needlecraft 450 Nostrand Ave., 347-789-5371. Plenty of beginner’s classes with a three-part crochet series and knitting 101. String Thing Studio 54 7th Avenue, 11217 929-337-6130. Special beginning knitting class: My First Hat, Children’s Knitting for ages 7-12. Weaving classes and private lessons.